Ok, so next is Day 27 - Inspired by an artwork! Now an absolute fave of mine is Van Gogh's Starry Night, but as I've already featured that on my nails (stay tuned for a post on it!) I wanted to go for something different today! I chose one of Wassily Kandinsky's Colour Studies from 1927 for this day, mainly for the colour factor - as you all know, we love a good splash of colour at HanDee! Very, VERY easy to do guys! A more time consuming than some designs, but only because here I decided to do one nail at a time to make sure nothing went wrong. You'll need about 8 different colours for your design here, any you like and then go mad! 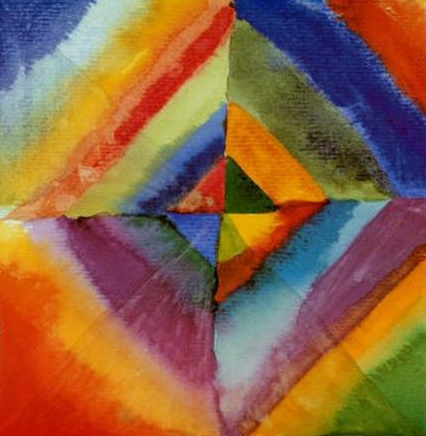 I found starting at the centre the easiest, painting small triangles then work outwards using different colours. Try not to have the same colours touching! Not bad eh? And very fun to look at!